July 1981. 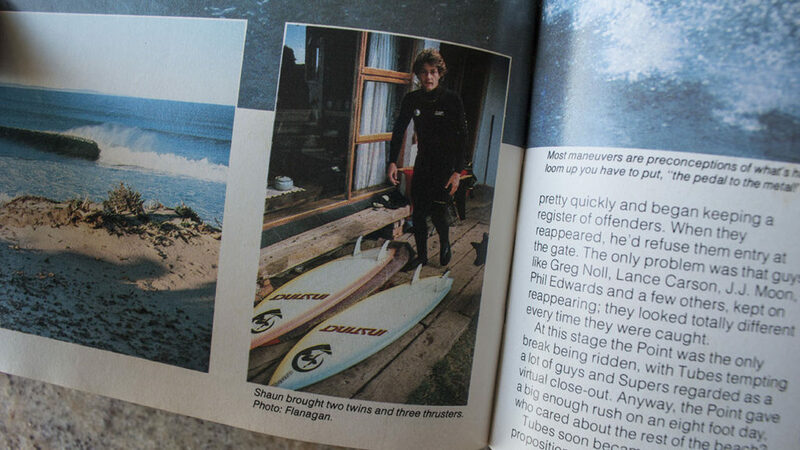 At the start of the Thruster revolution, twin fins were the go across the planet. Potter cut his teeth on the twinny. Stussy switched California onto his special brand of twin fin. In Newcastle Australia the illustrious Mark Richards was all over them. Shaun Tomson, the king of the round pin single fin, even had a couple secretly stashed at Cheron’s place at Supers that winter. A mild mannered Byron Bay local, Gary Timperley happened on Jbay that winter. Unheralded and largely unknown on these shores, the lanky Aussie found his twin fin arcs and the walls of Supertubes perfectly matched. Like no other before, then or since. There was a star studded crew in town. Dane Keoloha led the Hawaiians. Terry Richardson was there with Mark Scott, Derek Hynd and Richard Cram, some of whom were ambivalent to the twinny and skipped straight to the thruster. Inevitably a deep Atlantic low adorned Supers with a high calibre swell to match the buzz team in town. The lasting impression for me that week was how long Timpo held onto those bottom turns with two fins and sometimes only one in the water. Nowadays evergreen fishes and the retro twin fin in the hands of Asher Pacer https://www.youtube.com/watch?v=B-b-GiMdOug https://www.youtube.com/watch?v=l7a57AyuWFI, Dave Rashovitch and Craig Anderson https://www.youtube.com/watch?v=dSxzdXky3w0 are relevant but more importantly a lot of fun. In 1982 Gary returned to South Africa, spent a week or two in Port Alfred with his buddies and then went on the win the Mainstay in Durban. THE FULL SEQUENCE IN SURFER MAGAZINE. EVEN SHAUN TOMSON, THE KING OF THE ROUNDED PIN SINGLEFIN HAD A TWINNY OR TWO IN HIS QUIVER.